Creating stories is my life. I have always been enthralled by the written word and there is nothing better than falling into a book and completely forgetting the world as I explored the one I was in. Nick was always and forever will be my biggest fan. He was there for my first book publication, went to all my book signings, and had a huge impact on my second book. He is the main topic of my fourth book, The Puzzle Quests, Shimmer’s Eggs. He also was a creative writer and loved to read as much as I did–probably more. An avid lover of the library, Nick always wanted to share his love of books. When he passed, I longed to hear any story someone wanted to share about Nick. There were so many, and as it warmed my heart, it also broke it. He had so much to give, and I couldn’t understand why his life would be cut short. After nine years, it’s hard to imagine there would still be stories that I hadn’t heard from when he was with us. Recently, I was in our bank talking to the manager. She wanted to help with Nick’s Fight to be Healed Foundation. I was very happy to hear that and looked forward to working together. Then she shared a story. When Nick was in middle school, he volunteered to be a book buddy for his elementary school. Sharing his love of stories and reading to other kids was the perfect way to help others. Her son, who is also named Nick was involved in this Book Buddy program. My Nick was his mentor and buddy. Nick also brought him some fun items to encourage reading. He and his mother never forgot it as the connection impacted them both. Stories are precious. They connect people, they heal, entertain, and help us remember those who have gone before us. I am grateful that she and so many others have shared their Nick stories with me. It reminds me that he is always here. It has long been said that once you meet a De Tillio, you are never the same. When you are in a room with De Tillio women, you know there will be a lot of laughter, crazy antics, and outlandish conversation. My father and brother learned to go with the flow and be very flexible with four exuberant women in the house. Today we got together to celebrate our fall birthdays, shop, and well…laugh. It doesn’t take much. And the funniest part is that no one else may understand what we are hysterically laughing about. It just happens, doesn’t stop, but can be quite contagious. We aren’t afraid to be the brunt of the joke, act ridiculously, or be plain old corny. See below. Technically Stephanie (on the left) and I are the middle siblings, since Sal is the oldest, but I have always been considered the middling. It’s not easy having to balance the Stephanie’s sharp outbursts of comedic humor from the emotional volcano of Michele (on the right) when she passionately expresses her opinion or one of us has been wronged. Having an older and younger sister has always meant that I had someone to look up to and take care of me and then someone I protected and babied. I am like the filling in the Oreo cookie. I can go it alone, but man it so much better all together! I am grateful for the laughter, love, and silliness. Our family has been built on having a grand time no matter where we are or the circumstances. I love being a Cammarata, but I will always be a down home De Tillio gal! Today I am grateful for taking the time to be with a special family. 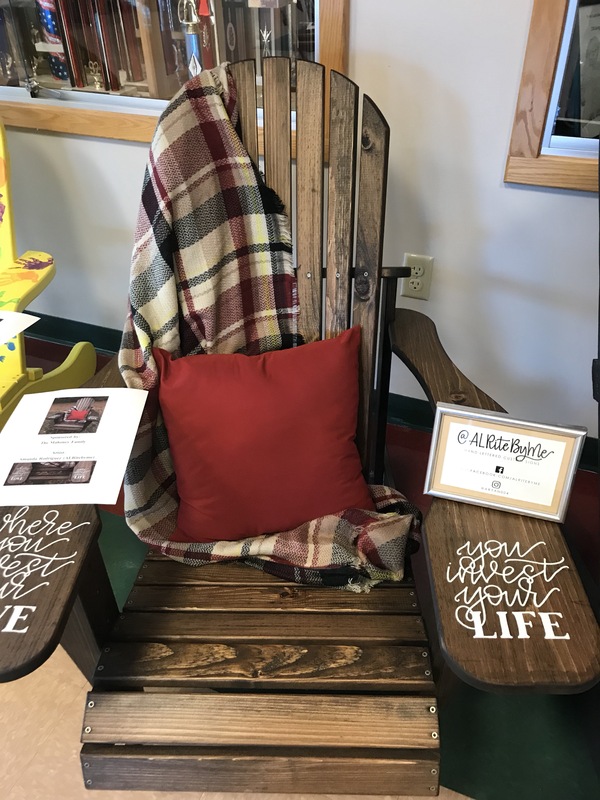 There was a Chairity fundraiser in memory of Nick Heald who passed away July 29, 2017. There were so many amazingly crafted Adirondack style chairs made by those who love and miss this beautiful young man. 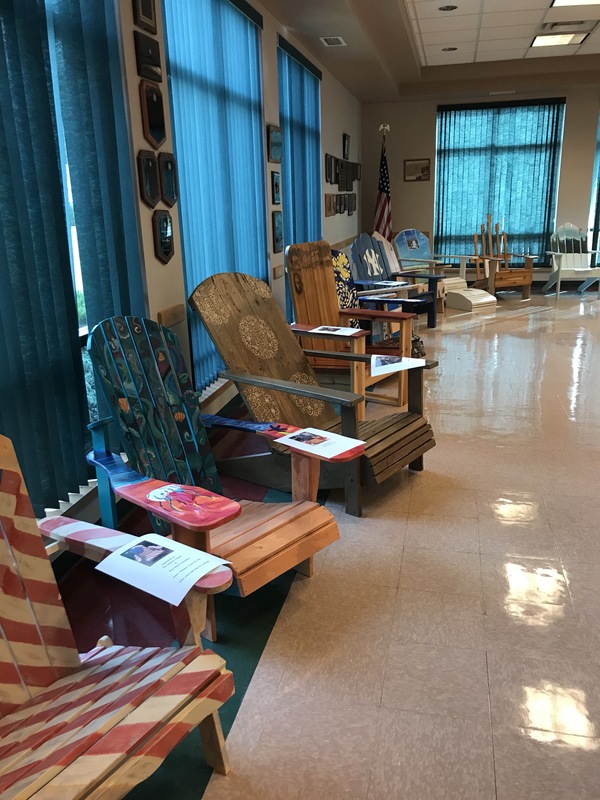 Nick always made a similar chair for the South Glens Falls Marathon Dance that annually raises an incredible amount of money each year to help families in need and local foundations. Events like these help the family, and I felt so much love as everyone united over a common cause. I was glad I went and thankful to everyone who treated me like family. I am grateful that 17 years ago, Nick and Connor brought Colleen and me together. Our boys met on the bus and lived right around the corner from each other. In addition to playing together, Connor joined Nick in karate and our families bonded. Colleen is a powerhouse of vitality, integrity, grit, and perseverance. Whatever she does, she does with intention and full-charged energy. If you ever need someone in your corner and to cover your back, Colleen is the Charlie’s Angel of our tribe. She has always supported me in any crazy plan I come up with, loves with all her heart, and sees the good in others. She is one of the biggest supporters and volunteers behind Nick’s Fight to be Healed Foundation. When Nick was ill, Colleen took the initiative and started a fund knowing we would need financial support for his transplant. When we lost him, she came to the funeral home and helped us with all the arrangements. A sister of my heart, she has supported me in some of the hardest tasks in my life. We could not have done it without her. It takes a damn strong woman and friend to take on those tasks. She stands true to what she believes in and is an inspiring warrior. She isn’t afraid to speak her truth and fight for others. For the past 10 months, Colleen has been battling her own fight against breast cancer. Colleen took this disease with a vengeance and intensity that she brings to every day of her life. She has shown that a positive attitude is one of the biggest healers. Nick must have known I would need a tribe of amazing women to get me through life. Colleen is certainly one of them. For her 50th birthday, I wish her love, endless joy, and strength in her purpose. I am grateful for sunflowers. Nine years ago I lost my boy. In my life, there has been no greater pain. As sunflowers arrived at my door, I thought of Nick. Their upright and sturdy stems speak to strong bonds and loyalty. Nick was loyal to his family and friends. He stood for what he believed in, not worrying about any cost to himself. The strong bonds he held with people continue to this day, because his roots and values ran deep and he loved with all his heart. The color of sunflowers are as vibrant as Nick’s smile. He always smiled. Oh yes, he had his moments, but sunshine and love lit through him. He brought laughter, joy, and had the ability to make others smile. Pictures of Nick–always have a smile or smirk. Sunflowers provide nourishment, hope for continuing life. Nick physically isn’t here, but his spirit, his strength, his determination feeds my soul when days like today are so hard. The work we do in his name provides hope and emotional nourishment for other children who face cancer. As the sunflower blooms it turns toward the sun. It rises to each new day–faces the positive, conveys warmth, and happiness. That is how I remember Nick. Always positive, seeing the good, sharing his arm personality, and being such a happy boy. I strive to be like him in these ways. When I miss him, I raise my face and my heart to the sun. I feel his warmth and energy. He’s always with me, and I’m grateful he chose me as his mom. For everyone who thinks of Nick and remembers him today, I hope your day is filled with love and sunflowers. We are all raised with a certain perspective based on our parents’ influences, beliefs, and opinions. When we head out on our own and experience different situations our perspective can change. Sometimes a new way of looking at life is thrust upon us by opportunity, tragedy, loss, separation, relationships, the list is endless. Some are positive and some not so much. And we long for the time before our lives were flipped upside down. My life, just like so many others, has been flipped upside down and it’s tough to handle especially this month. Tonight I am grateful I took the opportunity to try something new and literally change my perspective. Whether it’s aerial yoga (I think I grew an inch, but my head felt like it was going to explode) or traveling to a new place or going back to school, doing something different, switching your life upside down on your terms can open your mind to so much. Tonight I needed something physical to get me out of my head. I needed to shake up my perspective that October is really difficult for me and have do something adventurous. It was fun, and I’m grateful my sidekick was there with me. I’m not sure if this type of yoga is her thing as there was plenty of swinging through the air, but she was openminded enough to give it a try. No matter what I do, I am grateful my perspective on life hinges on the hope that tomorrow will be better, the knowledge that I have a whole tribe who have my back, and I am strong enough to bend, but not break. I am grateful to have boys who remind me to catch the moment and be in the present. Stephen continually reminds me to pay attention to what he is saying or what we are doing instead of trying to take photos or write down daily details. I can’t seem to help it. I have always been that way. In a way it’s a good thing. If your kids grew up with mine, there’s a great chance I have some awesome photos of your child. It can be bad, because Stephen hates getting his photo taken. I may be at fault for that! I love capturing those moments, but it’s true they are never quite as pure or true as when they are happening. And when they are happening, my face is behind the camera. I miss the good stuff. Take today. During a break in the rain, I took Zoey and Dakota out for a walk. I left my phone in the house (I know it’s a shocker!) and we strolled down the road. I was immediately in awe of the clouds. Some were laced along the sky while others were floating by like shreds of cotton balls. Flurries of birds flipped through the air. There were so many and they flew so erratically, they looked like black leaves just released from the trees. And fall trees. They are my favorite. Deep red scarlet, burnt orange, buttery yellow, golden brown, bronze, and green hues. The brilliance reminds me of the beauty this world can hold. I was surrounded by it and knew it mattered. That moment, not the photo that I could have taken, but being in it right at that time and place. You’ll notice there isn’t a photo for this post. It’s in my heart and my mind. I hope you take a moment to enjoy where you are right now. By the way, in my dream the other night, Nick told me to put down my camera and take in the whole picture. Messages are all around and for that I am especially thankful. I wake up and appreciate what I have. There was nothing lazy about today, but being home to get caught up feels likes downtime to me. When I’m running around all week, all I look forward to is one day to sleep in and do stuff around the house. I slept until the dogs made themselves known by barking at whatever noises freaked them out. That was fine, since I had a whole list of items I wanted to finish. The usual–laundry, vacuum the piles of dog hair, use my dishwasher that finally got fixed (woo hoo! ), clear the dining room table, food shop, bills, etc. See, not so lazy of a day. It was such a beautiful day out that I had to take the time to enjoy it and walk the dogs. Lauren who lives next door and Addy who lives across the street love walking the dogs with me. Today they were playing together (they are 7) and asked to walk the dogs. So we took a stroll, they basically ran with the dogs and talked. Not stressing about what needs to be done and spending time with the kids on the street makes it a lazy and wonderful day. After food shopping, I made an orzo soup that was perfect for a day of chilling and catching up. My husband’s lazy day consisted of playing soccer, then cleaning up the yard and gardens, and prepping for winter. The soup was just what we needed to slow down. Now that the bills are paid and there’s still some money left over (another woo hoo! ), I’m going to chill out and read. The upcoming week may be plum crazy, but today was plain lazy, and I’m grateful for both. Stephen was born exactly two years and two weeks after Nick. We barely made it to the hospital or onto a bed before he shot out into the world. He hasn’t stopped since. Nick always made Stephen laugh and was his best translator. Whenever we couldn’t understand what Stephen was saying Nick could tell us. Stephen never rolled or crawled. At 13 months, he actually walked in Disneyland just like in the commercials. After that he was always on the run. Yesterday Luke and I went to see Stephen to celebrate his birthday. I am thankful he still hugs his mom, although not when there are girls around that he wants to meet. That’s all right! I take the hugs when I can get them! I am grateful Stephen has wonderful friends who are like brothers to him. They have grown up together and have always been there for each other. Stephen is loyal, kind, compassionate, and true to family. He has a good heart, and I am so happy whenever I get to spend time with him. He is such a pleasure to talk. He has his own mind, opinions, and path. We talk about the world, music, school, philosophy, and dreams. Every milestone in his life has been intriguing as I see the man he is becoming. I am grateful he chose me to be his mom to raise him, instill good values, and allow him to go the way that is best for him. He will always be my baby. His smile and the love in his eyes warm my heart.